I’ve had very vivid dreams for as long as I can remember. My imagination goes crazy at night, and this dark, twisted side of my subconscious emerges. I have had nightmares that would put Stephen King to shame. I’ve dreamed about my own funeral, finding bodies under my bed, nightmares about mental hospitals, butcher shops and people I love dying; I dreamed that my son was dropped on his head on a sidewalk when he was a newborn (I was utterly devastated, and had to go check on him before I could even think about going back to bed)! I’ve had countless dreams of tornados and plane crashes (all of which I’ve survived), dreams where I am in murky water surrounded by snakes & alligators, or that I’m in an ocean with huge waves where I am desperately trying to save my son, or I’m watching a horrible accident unfold right in front of me and I am helpless to stop it. It is so real when I dream, I actually believe it’s happening. It can be quite terrifying; I sometimes wake up hyperventilating, crying, sweating, and so very confused. Sometimes I almost scream in my sleep and wake my husband up (which says a lot, since he sleeps through anything)! I have experienced a strange state of deep sleep/consciousness where I literally couldn’t take a breath-my brain told my body to breathe, but my body refused. I was completely paralyzed-I couldn’t move a single muscle, breathe or even make a sound. I started suffocating; as if my mind, body and soul had completely disconnected. I was wide awake on the inside, but my body felt almost dead. I remember laying there in my bed, only a teenager, honestly thinking, “this is it..I’m dying in my sleep right here, right now.” No matter how loud my mind screamed at my lungs to breathe, they just wouldn’t do it. I reached a point where I wasn’t even scared anymore-I just accepted what was happening. Suddenly, my lungs gasped for breath! I was so relieved. It’s happened a few times since, and its always horrifying. I still have a lot of nightmares, but not always. I have had a handful of amazing dreams where I can fly, or talk to loved ones that have passed. Most of the time my dreams are kind of dark, but it doesn’t bother me so much anymore. Maybe I have learned to embrace them instead of fear them, I don’t know. I have dreams that predict the future, dreams that are so spiritual that I can’t shake the feeling they were more than just a dream, and some that are an entertaining mish-mash of my waking life. 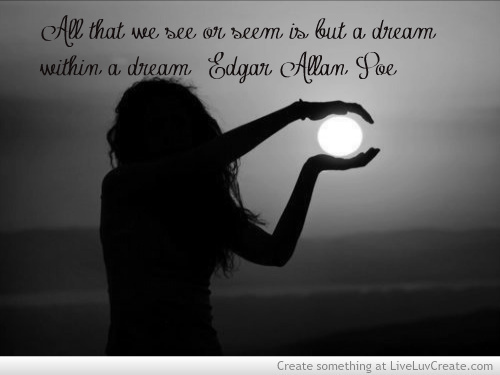 I have been greatly intrigued by dreams since childhood…always seeking their meaning. It is like tapping into a part of myself that I cannot access while awake. It is so fascinating! It’s a whole different side of me that I can’t access at will-I have to wait until it feels like revealing itself. I can’t help but wonder what it would be like to have full access to my subconscious, to unearth everything hidden away in there, see the repressed memories, and experience it’s uninhibited, limitless imagination while awake. Does it hold the key to who I really am? What could my subconscious teach me? Would I have a greater understanding of myself and the world? Or would it be too overwhelming, too dark, and much more than I can handle? I may never know. I would love to hear everyone’s thoughts on this. INFJs, do you all have vivid dreams as well?